Based on this information, the Child Development Centers (CDC) on the College’s Macon and Warner Robins campuses will pilot evening childcare services and family engagement activities for student‐parents enrolled in night classes. The CDCs at CGTC have been working on more innovative ways to assist student-parents with quality childcare. As recently as October of 2018, each CDC launched a new childcare tuition support project called Start Titan Strong for students with dependent children, funded entirely by the award of the Child Care Access Means Parents in Schools (CCAMPIS) grant. The TGIG will back the evening childcare support project called Connect-2-Complete to pilot as early as the fall 2019 semester. The creation of affordable and convenient childcare options for student-parents is what the College and CDCs consider paramount for a large percentage of its student population’s progression through their education. A review of CGTC course offerings and enrollment for the grant revealed that evening childcare services are a significant gap in support services that the College hopes to close. Scholarships and other grant funding offered through the Centers for daytime care will not aid parents in covering new evening care costs. Personnel at each center can assist students in determining childcare costs and aid opportunities. The College is confident that flexible, evening childcare will attract and support underserved students at times that best support their pursuit of postsecondary education. Brett Copeland, the assistant director of Childcare at CGTC, helped design the Center’s pursuit of the TGIG funding and advancement of a two-generation approach to supporting children and parents. More than 200 evening classes at CGTC meet at times beyond the CDC hours of operation. CGTC’s grant proposal to Two Gen indicated that night classes at the College currently operate at just under 60 percent capacity. Piloting part-time evening childcare options will allow more student‐parents to fit classes into a busy life or schedule, and provide support to both CGTC students and their children. CGTC has two on-campus Child Development Centers to meet the childcare needs of student-parents pursuing postsecondary education. As for now, the staff and leadership at each Center will rely on feedback from a survey of former, current, and potential students of the College, including parents whose children are being served in area childcare and Head Start programs, to help determine what the evening care pilot should look like, including times and pricing, at each location. “Parents of children in early education childcare sites and Head Start programs in Houston and Bibb counties can obtain a survey from their provider April 1-5, 2019. Students of CGTC will receive a link to the digital version of the survey in their email during the same time,” Copeland said. Connect2Complete, funded by the TGIG, will support the piloted evening care by offsetting staffing costs, making it more affordable for families with demonstrated need. Details on the funding sources that best support a student-parents education, as well as ages served and application information for the pilot program, will develop as the CDCs approach the evening care pilot launch date. Scholarships and other grant funding offered through the Centers for daytime care will not aid parents in covering new evening care costs. Personnel at each CDC can assist students in determining childcare costs and aid opportunities. For more information on TGIG, contact Brett Copeland at bcopeland@centralgatech.edu. 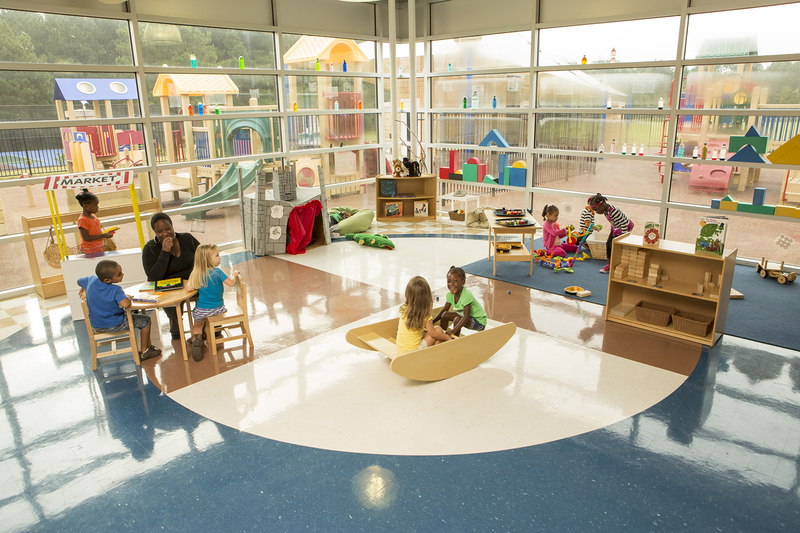 Photo: Children play inside the Child Development Centers (CDC) on the College’s Warner Robins campus. This entry was posted in 2019 and tagged Brett Copeland, Bright from the Start, chiildcare, child development, DECAL, early childhood education. Bookmark the permalink.